Although I’m not really big on St Patrick’s Day – Irish dancing, green beer and Guinness hats aren’t really my thing – I do love an excuse to make fancy cocktail recipes, especially holiday-themed ones! 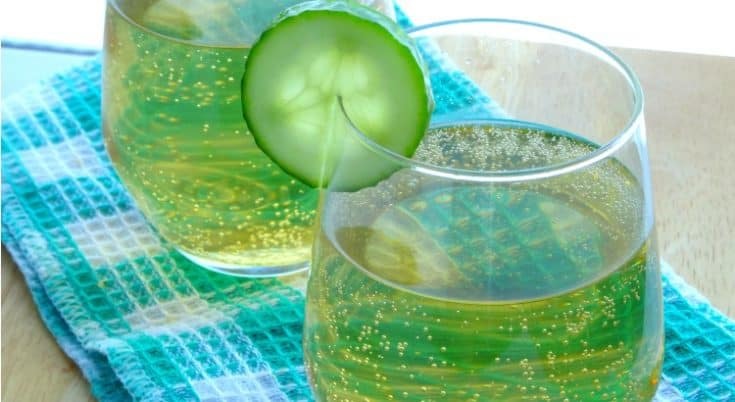 And since St Patrick’s Day has become more about drinking alcohol and talking about relatives from generations ago who were 1/4 Irish than anything to do with St Patrick, what better way to celebrate the holiday than with a sparkling themed drink? In case you didn’t know, there is already a St Patrick’s Day drink recipe out there called a Sparkling Shamrock, but since it contained mostly ingredients I don’t really like, I decided to switch it up a bit (as always) and ended up making my own version. Wonderfully sweet, fruity, floral and fizzy, this St Patrick’s Day drink recipe is leaps and bounds ahead of green beer! Like all my favourite drinks recipes, this cocktail is super-easy to make. Put all the ingredients into a glass, stir and – if you’re feeling fancy – add a slice of lime, cucumber or something else green to the side of the glass before serving. Because really, who wants to be following complex, multiple-step cocktail instructions on a holiday when everyone else around you is having fun and getting drunk? Want more delicious cocktail recipes which are easy to throw together? Then you’ll love my ebook – A Year of Cocktails: 52 sensational cocktails for sipping throughout the seasons! It’s absolutely packed with everything from hot toddies to keep you warm during winter to fruity sangrias to help you keep cool during summer – you’ll never need to search for another cocktail recipe ever again! Place all the ingredients - except the cucumber or lime slice - into a small glass and stir. Decorate the glass with a slice of cucumber or lime and serve. Thanks, Krissy. And your totally right – you could enjoy this cocktail any time – not just on St Patrick’s Day! And you two are definitely right! Looking forward to making this again when the weather is a bit warmer. Thank you so much, Joy. You’ve just summed the drink up perfectly! Sorry just wondering are you Irish? Nope – I’m not Irish. And I’m really sorry if I’ve offended you – I never intend to offend anyone at all through my blog posts. As this is an entirely personal blog, everything I write is my own opinion which some people agree with and some people disagree with entirely. Anyway, I’d like to thank you for stopping by and hope you have a wonderful St Patrick’s Day dinner – it sounds delicious! I wouldn’t ask only I am and I have never once even seen green beer nor do I see St. Patrick’s Day as an excuse to drink excessively. I was looking up some nice drinks to have after dinner, which is going to be roast lamb with garlic and rosemary by the way as most Irish would traditionally have colcannon around Halloween. Its more an Autumn/Winter dish than a spring dish as Kale would be a winter veg. I think that this sounds like a lovely refreshing drink to enjoy as maybe an aperitif or after but as most people in my family don’t drink too much it will probably be the only drink of the evening. I know some people use St Patrick’s Day as a way to over indulge in drink but please don’t assume that everyone does and you should really be careful what you blog as your own experience isn’t necessarily the norm. This looks just so perfect I had to include it in the 35 St. Patrick’s Day Must Haves. Thank you for linking up at Thursday Favorite Things and hope to see you again! Look I really did take offense which i don’t normally do. I sorry if I sounded harsh but it gets a bit tiring listening to what is basically a racial stereotype. Mostly made up and exaggerated and by American marketing ideas. I hope that some time in the future you get to enjoy a normal, quiet paddy’s day which is always a fun way of celebrating a serious issue, Irish independence and those who fought and died for the Irish to have it. So if you want to celebrate St Patrick’s day the right way forgo the begorrah and leprechaun nonsense, wear a bit of shamrock and say a prayer for those who are still fighting for justice and equality. Then spend time with those you love enjoy good food (which your blog is filled with) and maybe a drink or two and please try to be a little more sensitive. And seriously I never even seen green beer! Just stopping by to let you know your sparkling shamrock cocktail is featured in a St. Patrick’s Day roundup over at The Pin Junkie. Thanks for sharing! Fantastic drink. If you don’t have elderflower syrup sub with a drop of honey. If you have wildflower honey even the better. Thanks so much, Paula. I’ve never tried the cocktail with honey before – what an amazing idea! I am in the process of writing some blogs for my online clothing boutique. The blog I am currently writing is called “10 Boozy Cocktails for Your St. Patrick’s Day Party.” I would love to feature one of your images in my blog and of course I will link back to you. May I have permission to do so? Thank you for your consideration.